Withdrawn and unloved, Frederick is a solitary man who works as a clerk and collects butterflies in his spare time. He becomes obsessed with young art student Miranda but feels as if she is out of his reach. It isn’t until he wins at the pools that he sees his chance and is able to act on his obsession. Devising a meticulous plan, he kidnaps Miranda and The Collector explores their time together. The book begins with Frederick’s perspective and Fowles paints a picture of a withdrawn, lonely, and socially inept man who seems to be stuck in his fantasies. He isn’t depicted as a monster; instead I felt sympathy for him – throughout the novel it almost felt as if events were running away from him, as if he wasn’t always fully in control of what he was doing, and although Frederick was completely responsible for Miranda’s kidnap, I pitied him. His careful preparations for Miranda’s arrival take Frederick’s character away from a caricature villain to one that is more complex. Fowles manipulates the reader’s emotions in his creation of Frederick – one minute Frederick’s justifications of his actions are chilling, but the next I pity him. Despite the empathy you sometimes feel, he is quietly terrifying and it’s this that makes the novel so powerful – there’s an underlying tension and suspense that keeps you turning the pages. Frederick’s obsession with Miranda feels very real and, before the kidnap, he has ideas of how she will treat him and how they will be together. But these all disintegrate as Miranda proves herself to be a living, breathing young woman with ideas and beliefs of her own and who doesn’t want to be held captive. I thought this aspect was incredibly well done in the novel, seeing Frederick’s hopes dashed and how his expectations didn’t meet up with reality adding to his character and our pity for him. Part two of the novel shifts perspective to the diaries that Miranda manages to keep throughout her time in captivity. This change in perspective slowed the pace of the novel somewhat by returning to the beginning of the story and seeing events from her perspective, as well as moving away from the oppressive countryside cottage to her life in London. Yet these sections, particularly at the beginning, helped to create a sense of suspense and tension, while offering an interesting perspective on the events of her kidnap. I found it difficult to warm to Miranda at first – I found her to be arrogant in her ideas and I didn’t feel the sympathy for her that I expected to – but she soon evolved into a more complex and endearing character. I began to connect with her more, particularly as I’m only two years older than she is in the novel, which added to its power for me. I found her emotional switches from desperation to pity touching, yet I still preferred reading Frederick’s perspective in the novel. The novel is character-driven, focussing on the meeting of these two very different minds, with both characters each very distinct, real, and compelling. The two points of view given in the novel work to show the differences between them which makes for a fascinating read. The ending of the novel is tantalising and fits perfectly with what has preceded it, making the novel even more memorable. Fowles’ clever insights into Frederick’s mind made this novel a disturbing and dark, yet compelling read. 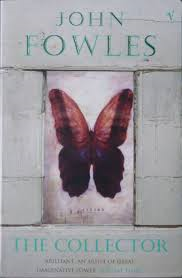 I’ll definitely be looking into reading more of Fowles novels after reading this one. If you recommend any, please let me know! Have you read The Collector? This has been on my TBR for a while and yours is the most comprehensive review of it I’ve read. I want to read it even more now!